Activated Carbon is a micro-porous material which is used in many types of filtration systems because of its effectiveness in removing a wide variety of dangerous contaminants. Due to the tremendous surface area of activated carbon and its porous composition, it has the ability to filter out gaseous pollutants, volatile organic compounds (VOC’s), and hydrocarbons. Contaminants attach to the bonding sites through a chemical attraction process called “adsorption”, which safely and permanently removes them from the air. 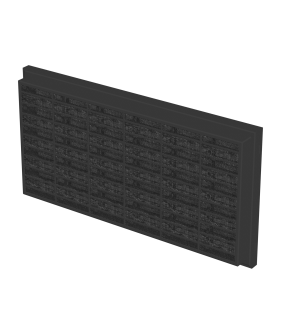 The Carbon Filter also includes an electrostatic particulate filter sandwiched between 2 layers of Activated Carbon Filter material, for trapping dust and debris. To install, simply remove the original electrostatic dust filter from the back of the heater and replace with the carbon filter. Do not throw away the lifetime electrostatic filter that came with the heater, you may want to use it again in the future. The carbon filter should be replaced once a year. In the event that you no longer want to replace the carbon filter, simply re-install the original electrostatic dust filter. Do not run the heater without the dust or carbon filter installed at the back of the unit. 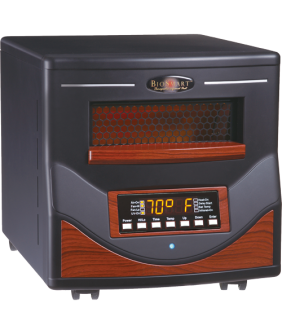 Simply remove the existing electrostatic filter from the back of the heater and replace with the carbon gas absorption cartridge. Maintenance: To remove dust build-up, just vacuum with the brush attachment of your vacuum cleaner. Important: Do NOT use water to clean the carbon filter. Check the filter every couple of weeks and clean at least once a month to maintain maximum airflow through the unit. Filter replacement: The carbon filter should be replaced once a year. Important: Do NOT use water to clean the carbon filter. Filter replacement: The carbon filter should be replaced once a year. Or, if you do not want to replace the carbon filter, simply re-install the original electrostatic dust filter.